As a new OpenFOAM user I had the opportunity to attend the 10th OpenFOAM Workshop held at the University of Michigan in Ann Arbor, Michigan. Pointwise participated in the workshop in a variety of ways: we sponsored it, we worked the booth, and we presented our own work. In short, it was a great week! The nice weather (coming from Texas that is very important!) and the university’s beautiful campus characterized by open spaces and a unique combination of classical and modern architecture made this the perfect location for the workshop. On top of the nice setting, a relaxed atmosphere and the collaborative spirit among all the participants greatly facilitated (and I would dare say encouraged) the exchange of ideas, experiences, and current struggles with some of the most renowned names in the OpenFOAM community. In my opinion, the workshop was well structured and nicely organized (kudos to Dr. Kevin Maki and the organizing committee!). It featured a nice balance between keynotes, papers, and training sessions that pretty much guaranteed that everyone in attendance would come out of the workshop with a good understanding of the current state-of-the-art in OpenFOAM and the challenges being faced by this community moving forward. On the first day of the workshop I attended the Pre-Processing/ Post-Processing/ Meshing session. The first presentation was entitled Assessment of Automatic Mesh Generation Algorithm Using snappyHexMesh 2.3. The presenter did a very good job discussing the performance of the different Cartesian dominated mesh generation algorithms in snappyHexMesh using different geometries focused on internal turbulent flow applied to hydraulic machinery. This presentation was particularly interesting to me because it was my first encounter with snappyHexMesh. Another truly interesting presentation in the same session was the one entitled Evolving HELYX-OS, the Open-Source Graphical User Interface for OpenFOAM. As you can imagine, the idea of a graphical interface for OpenFOAM sounds very appealing to a new OpenFOAM user like myself! Here the presenter showed the main features available in the new HELYX-OS v2 software. He focused on the new interface for the creation of block meshes and the visualization of feature lines to allow for a better detection of edges during the mesh generation process. Overall, the presentation was a nice overview of HELYX-OS. Just in case the seemingly unending stream of very good and useful presentations was not enough, the workshop also offered twelve training sessions that spanned a variety of relevant topics to the OpenFOAM community. The best part of this was that the training sessions were conveniently divided into three different levels: basic, intermediate, and advanced. Each track ensured that attendees would learn something useful regardless of their level of expertise in a certain area of interest. I had the opportunity to attend two training sessions: Introduction to Paraview (beginner level) and A Concise Introduction to snappyHexmesh Theory and Application (intermediate level). I enjoyed both of them! They gave me a greater insight into the inner workings of these two pieces of software that are used by several of our customers. As a member of the Support Team, having knowledge of the different tools being used by our customers helps me to better understand their grid generation needs and this, in turn, allows me to provide them with a high level of technical support. On Wednesday afternoon Travis Carrigan, a Senior Engineer in our Sales & Marketing Team, joined Optimal Solutions’ Mark Landon to discuss our joint automotive design optimization work. 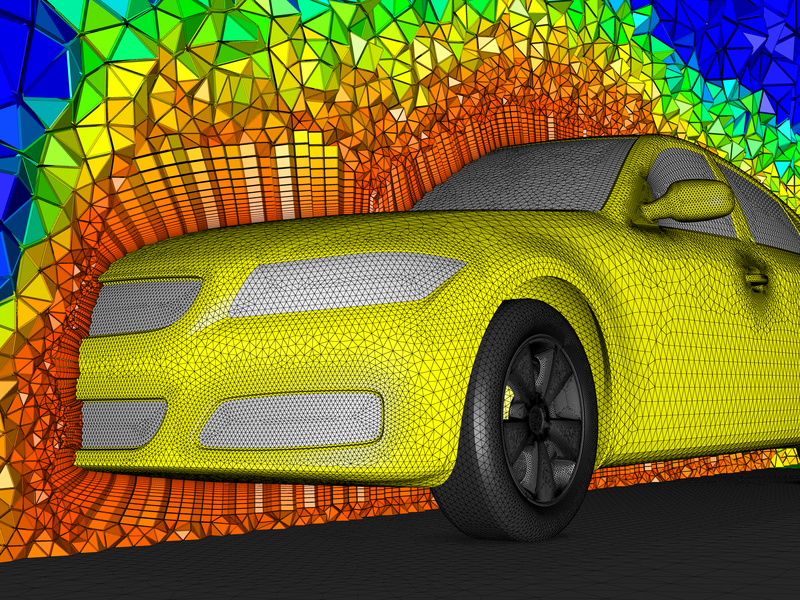 Our paper titled Meshing Considerations for Automotive Design Optimization described a collection of strategies and best practices for cleaning and meshing complex analytic CAD models encountered in the automotive industry. 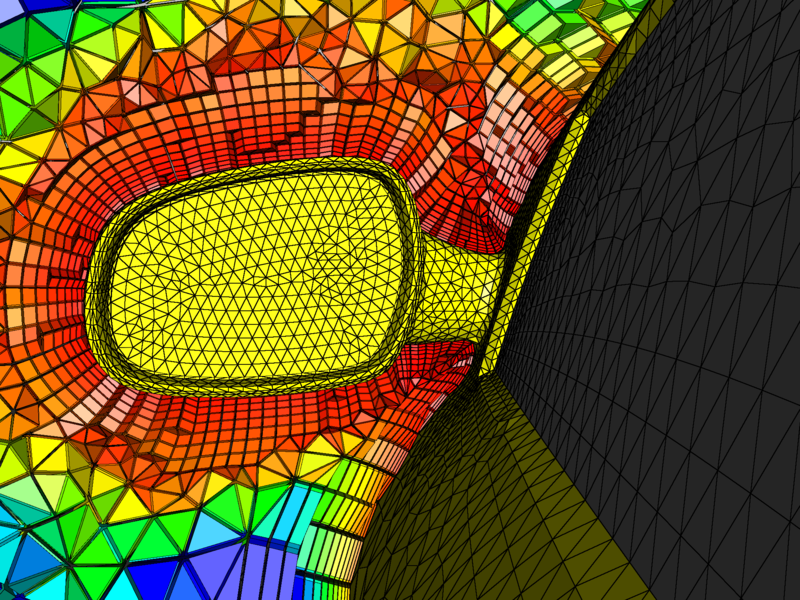 The high quality grids generated by our viscous unstructured meshing tool, T-Rex, are a prerequisite for shape deformation as they eliminate the need for remeshing from the typical design optimization loop. High quality meshing coupled with robust shape deformation techniques enable large space design exploration for optimization without the need for remeshing. Hybrid volume mesh for the DrivAer geometry colored by element volume. A close up of the side mirror shows in detail the anisotropic layers of combined prisms generated by our T-Rex algorithm. To wrap up the content-packed Wednesday, we had the chance to relax and enjoy a nice reception at the Henry Ford Museum in Dearborn, Michigan. The museum houses a large collection of rare exhibits including John F. Kennedy’s presidential limousine, Abraham Lincoln’s chair from Ford’s Theater, and the Rosa Parks bus among many others. If you have never been there (or if you have been there and would like to check out the new attractions), it is highly recommended! Two of the main attractions that we got to enjoy at the Henry Ford Museum: the Rosa Parks bus and Lincoln’s chair from Ford’s Theater. Grid Generation Software: To our surprise there were 21 different grid generation packages currently being used by the people in our group. Furthermore, everybody was using at least two different tools to generate the grids that they need. Grid Quality: Grid quality and effect on solution accuracy was a reoccurring theme in our discussion. Metrics such as element volume, orthogonality, skewness, and volume ratio were mentioned as contributors to poor solution accuracy. That being said, grid quality goes beyond geometry and is also driven by the specifics of the simulation being performed. While there was an idea of coming up with a single grid quality metric for OpenFOAM, we elected to ask the community to describe the metrics that affect their solutions for a variety of problem types. Geometry: Most of the members of our discussion group pointed out that they primarily use discrete geometry in the STL format and that one of the biggest bottlenecks in their workflow is cleaning bad CAD data. We discussed the idea of using analytic geometry for quality and workflow improvements. Automated vs. Automatic: We took a vote and it was clear that engineers need control over their grids and that several tools seem to be taking that control away from the user in favor of automatic meshing. Solution Adaptive Meshing and Parallelization: All the members in our discussion group agreed that these two topics are very important to them. Particularly, they all want the ability to parallelize the grid generation process in order to generate bigger grids in a shorter period of time. Overall it was a great workshop and I would recommend everyone interested in learning more about OpenFOAM to attend in the future. Next year the workshop will be held in Portugal. We are very thankful to the organizers for setting up the perfect venue that allowed us to meet with old friends and make new ones while enjoying very relevant presentations and training sessions. We certainly hope everyone enjoyed the workshop as much as we did. If you’d like to learn more about the 10th OpenFOAM Workshop and view the presentations, please visit www.ofw10.org. This entry was posted in Events and tagged automation, automotive, dirty CAD, grid generation, grid quality, Helyx, meshing, museum, OpenFOAM, optimization, Pointwise. Bookmark the permalink.